Radiation: sending out rays; to shine; to glow. It gives life on Earth via the sun or destroys life via bombs and contamination. Less than two years ago Samoa suffered a tsunami. It survived and its people will flourish despite the setback from being on the verge of removal from the United Nation’s list of least developed nations. When I taught refrigeration at the technical institute in Samoa’s capital, Apia, we Peace Corps volunteers had a tradition of playing softball on the campus grounds against Japanese Overseas Cooperation Volunteers from the Japan International Cooperation Agency (JICA). We even played on the anniversary of VJ Day, the U.S. day of victory over Japan in World War II, but the game was in good fun and friendship, and we mixed the teams for a second game. Our American-Japanese friendships extended into other areas from work to parties to tennis tournaments and cultural demonstrations. For instance, I tutored my friend, Tatsuya Kanda of Osaka, in English and he taught me a little karate. Several years ago I breakfasted, tȇte-ὰ-tȇte, with a former U.S. Senator, discussing our respective writing projects and backgrounds. The conversation turned to his career and to history. 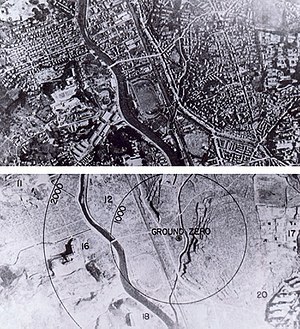 The atomic bombing of Hiroshima and Nagasaki was not justified, he said. Over the years, the issue has been debated extensively, whether or not the bombing helped end World War II sooner and saved more lives on both sides than it lost. To be clear, I am not entering that debate here. Additionally, he said it was a horrendous blow to humanity. And who could disagree? I could, at least insofar as a certain point I had. And it was this: the extreme human horror and radical devastation from those two detonated bombs made all subsequent nuclear-capable countries fear military escalation to an unprecedented degree. Consequently, it pre-empted a greater evil for the future of all humanity. So far, anyway—we came very close to nuclear war during the Cuban Missile Crisis when President John F. Kennedy’s top generals recommended the nuclear bombing of Cuba because the Soviet Union had placed nuclear weapons on the island. My breakfast companion sat back and, looking thoughtful, agreed that whether or not that bombing was justified, it likely served a greater good for all humanity in holding back any number of fingers from the nuclear button in later conflicts. I still feel the truth in this, and beyond the Mutually Assured Destruction of the U.S. vs. Soviets or other countries; it is applicable to all nuclear-capable nations. But that’s me, looking for sunshine because darkness is too easily found. And so, my proposal: take the nuclear waste from Japan’s stricken reactors and bury it within U.S. soil. First, they don’t have the room. Second, we do, with isolated salt mines and the like. It would be a literal and symbolic healing gesture that goes beyond friendship between the two nations to honor all life. From inflicting radiation in southern Japan—passing through their consciousness, bodies, and souls for decades—we could remove radiation from northern Japan. Sure, it’s poetic, romantic, and maybe even ridiculously radiant of love and white doves, but it is redemptive and meaningful. Perhaps President Kennedy, who was injured when a Japanese destroyer ran down his patrol boat during WWII, would agree. Moreover, we will all be safer and healthier worldwide by taking action on nuclear waste. American just needs the political will to lead the way, beginning with recycling and developing the long-planned U.S. repository under Yucca Mountain in Nevada.